The campaign for the Republican nomination was at times bitter and personal, with Trump even tweeting that Cruz accomplished "absolutely nothing" for Texans. As a testament to Senator Ted Cruz’s intense push for votes in what some pollsters predict to be a tight senatorial race against Congressman Beto O’Rourke, Cruz is campaigning with the son of his once bitter rival by his side. 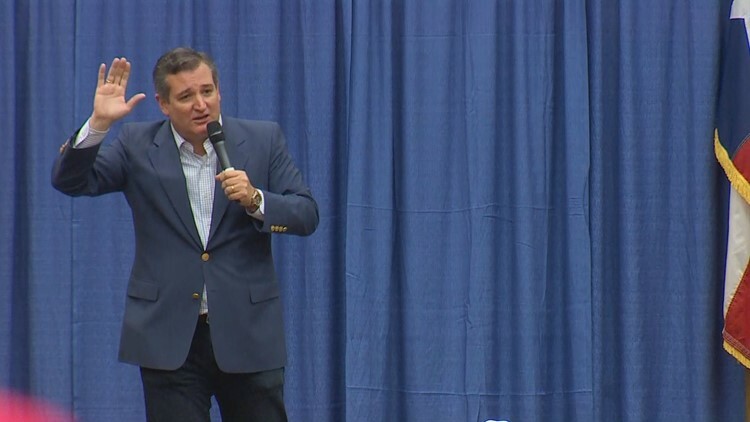 Cruz, stopping first for a campaign rally Wednesday afternoon at the Wichita Falls Multi-Purpose Event Center, arrived with his campaign partner Donald Trump Jr.
Trump Jr., introducing Cruz to an enthusiastic crowd of Cruz and Trump supporters, began by commending Cruz for mending fences with his father. The campaign for the Republican nomination was at times bitter and personal, with Trump even tweeting that Cruz accomplished “absolutely nothing” for Texans. Trump Jr. called it a testament to the senator’s character that he became a full-fledged supporter of President Trump and his policies – from the economy to immigration. “That was Texan character he did what was right, he’s fought alongside my father ever since on every major vote, for every policy piece,” Trump Jr. said. The Wichita Falls campaign stop was in deeply Republican territory. Wichita County voted 72% for Trump in the 2016 election. But while Sen. Cruz devoted much of his 20-minute speech to attacking Beto O’Rourke as too liberal for Texas, he also admitted that the El Paso congressman is raising more election dollars than he is – with “Hollywood” and “New York” money he said. Cruz also admitted that Democrats are energized like never before for the midterm elections, so he’s barnstorming across the state pleading with his supporters to be just as energetic too. As a testament to Senator Ted Cruz's intense push for votes in what some pollsters predict to be a tight senatorial race against Congressman Beto O'Rourke, Cruz is campaigning with the son of his once bitter rival by his side. Sen. Cruz and Trump Jr. were scheduled to travel next to another deeply red corner of Texas. Their next campaign stop is Wednesday night in Conroe in Montgomery County 40 miles north of Houston. They are expected to continue making campaign stops together during the final push to November.